Almost all antibiotics are known to appear in saliva and bronchial secretions, at least in trace amounts. However, in these secretions certain antibiotics reach concentrations equivalent to or even higher than the M.I.C. for numerous bacterial strains or genera that are responsible for the most common respiratory disorders. Such pharmacokinetic data are therefore of great interest for the choice of the most suitable antibiotic therapy for a bacterial infection of the respiratory system. The exact mechanism underlying penetration of antibiotics into the lung, of their secretion into saliva, or at least all of the factors involved, are still unknown . Antibiotics reach the bronchopulmonary system and saliva in two completely different ways. Salivary secretion is related to pharmacokinetic processes and to the degree of tropism for tissues, because the salivary glands do not offer any appreciable barrier to antibiotic penetration. 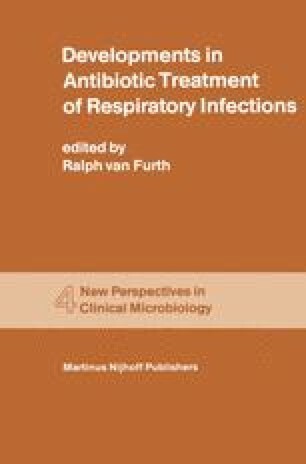 On the contrary, the concentration of antibiotics in the respiratory system seems to be completely independent of serum levels, and in healthy subjects bronchopulmonary concentrations are usually much lower (30–40 times) than those in the serum. These pharmacokinetic data led to the conclusion that there must be a blood-lung, or rather a blood-bronchi, barrier that may be even less permeable than the better-known blood-brain barrier . However, certain antibiotics reach surprisingly high (macrolides, lincomycin, rifampin, chloramphenicol) or at least therapeutic (ampicillin, cefalosporins) levels in the bronchi. This phenomenon has led some authors to suggest the existence of a mechanism of active transport able to concentrate some antibiotics selectively in bronchial mucus [3,4].